PicturesOnGold - Shop Lockets, Photo Locket Jewelry, Gold Lockets, Silver Photo Lockets and More Personalized Jewelry PicturesOnGold.com creates the finest Photo Pendants and Charms, Gold Lockets, Silver Lockets and other Personalized Photo Jewelry in the industry. We create lasting photo lockets and photo jewelry keepsakes using only the finest 14k gold, white gold and Sterling Silver. You send us your photos and using our patented technology we laser engrave your pictures in color right on our gold lockets, silver lockets, locket charms and most of our custom jewelry. The results are gorgeous gold lockets or silver photo lockets that open to reveal your photos and can be worn as a beautiful photo or picture locket. I received the Medium Heart Photo Pendant/Charm with Diamond Cut Edge $69.95 with the 18" Sterling Silver Box chain $25.95 to review. I don't know about you but when it comes to jewelry necklaces are my MOST favorite! I fell in love with personalized jewelry just a few months ago when I started researching online before that I didn't know much about the personalized jewelry besides that they make amazing little gifts and stocking stuffers, That being said with Christmas right around the corner who wouldn't love a personalized .. Anything! PicturesOnGold has a wide assortment of personalized gifts for a fantastic price. When I am shopping for personalized gift's for now on giftsongold.com is where I will be shopping for now on! From necklaces, rings, charms, Disney, to making your own personal items. I love it all, so will you! I had such a hard time deciding what picture I wanted to use for my picture jewelry. 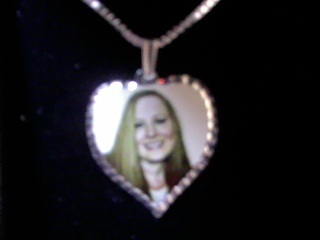 I finally decided on a picture of me, So rather I decide to wear the necklace for give it to my niece, mother, or one of my sisters it will be a heart warming and loving necklace to wear with anything, anywhere, or anytime. The stunning diamond cut out is a great addition to the picture necklace along with the oh so cute! Heart shape. I love silver jewelry it shines a mile away. and goes great with everything. 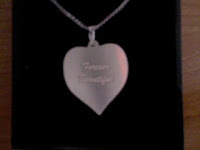 The picture's you can choose to design your necklace possibilities are endless. You can choose to have your picture (Like me) your children, your family, pets, or create your OWN design, such as your business logo. ♥ I receive no monetary compensation for this review. I was provided a Necklace to try and give my honest opinion.